Providing they've completed the Sanctuary quest. That's Marcy Long up there, who you'll remember from the opening of Fallout 4. She's the grumpy/angry one—with good reason!—at the town of Sanctuary, and along with her miserable husband Jun, they were kind of a downer every time you headed back to the starting area. 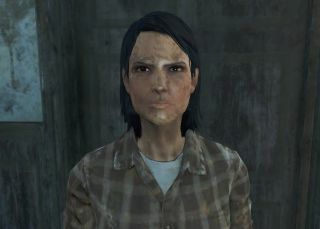 The internet seems to have decided that she's the worst character in the game—absolute madness in a game featuring the embarrassing Mama Murphy—and, as such, the internet will probably be very pleased with a new update for Fallout 4, which lets players murder both her and her husband Jun. As Shack News reports, update 1.7—live now on Steam—removes the immortality tag from Jun and Marcy Long, providing you've completed the early 'Sanctuary' quest. Other fixes/changes include "improvements to accuracy and control with picking up and placing objects" outside of Workshop mode, and the ability for vendors to offer "large shipments of Ceramic, Copper, Rubber, Steel and Wood". You can find the full patch notes here.